Home How to? news philippines How Much an Annulment in the Philippines? 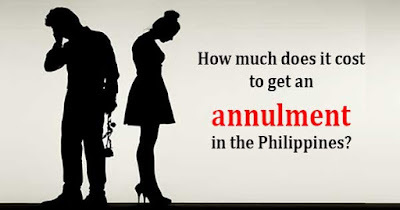 The case of annulment in the Philippines is very rare. The main reason why is because of its very expensive cost. Most of the Filipinos choose to be practical and not everyone could afford to apply for it. Maybe even a rich man would double his mind before applying for annulment unless he has really the strong desire to void the marriage. From the beginning, what is first an annulment? Are they similarities with divorce? In the Philippines, divorce is never been applicable because it is not in the book of law but an annulment could be. Annulment is a legal process where the courts declare a marriage null and void. Unlike divorce, it is usually retroactive, meaning that an annulled marriage is considered to invalid from the very beginning. To simplify it, a marriage has never happened. There were no husband and wife unite together, ever. A marriage could be declared void according to Art. 45 of the Family Code of the Philippines thru annulment on the following grounds. The lack of parental consent if either party is at least 18 but below 21 years old, the involvement of fraud, the consent for marriage by the parent but obtained by force, intimidation, or undue influence, the impotency or physical incapability of consuming the marriage, for having serious sexually transmitted disease and the most common ground used as a defense is being psychologically incapacitated by your partner. All of these grounds, when proven by the court, could annul the sanctity of a marriage. It can also lead a family to be miserable especially for children where at the first place, the spouse use only the process of annulment for his own interest. According to Att. Raymund Fortun, he revealed in an episode of “Bawal Ang Pasawa Kay Mareng Winnie” that annulment in the Philippines could cost around P450,000. Fortun said that he gave one of the lowest expected amounts because there are bigger firms that may charge by the hour and the final bill could easily double the figure he gave. Aside from the money, the length period of time for processing should also be considered. Att. Fortun said that the duration of years for his longest case was 3 years. This is due to several factors. A typical case can last up to 1 year and 2 months. Atty. Fortun and Pro-Divorce PH Chair Asliyah Limbona bring out a message during the show to mandate the office of the Solicitor General to protect the sanctity of marriage as another factor complicating the process. Abolishing this mandate could change the constitution, Att. Fortun said.